This is a pretty simple recipe, and I've added a few things to it that I think make it better. Set aside melted butter and stuffing mix and crescent rolls. Mix all other ingredients. 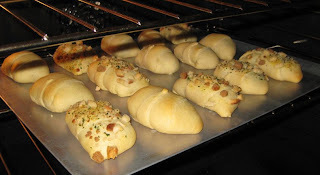 Roll out crescent rolls and fill with chicken mixture, and close up. Roll in butter and stuffing mix. Cook at 350 degrees for 20 minutes. As you can see, I didn't roll all of mine in the stuffing mix. No particular reason why. Those look yummy. PS I love the skirt you made! Mom told me it was pretty complex. She told me that when she was helping me make the shirt I'm working on that I probably would have destroyed without her help. :) Thank goodness for Mom.